Preface. 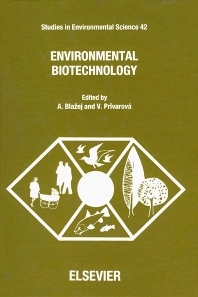 Relation between the economy, biotechnology and the environment. MICROBIOLOGICAL WASTE TREATMENT AND PROCESSING. Microbial waste water and waste treatment. Anaerobic treatment of effluent from epoxy resins production units. Anaerobic treatment of effluents: use of bioindicators for process monitoring. Simultaneous nitrification - denitrification in activated sludge process combined with biofilm cultivation. Hexamethylenetetraamine removal in single - sludge activation system. Experimental and mathematical modelling of activated sludge process. Aerobic thermophilic sludge treatment. Elimination of special bacteria from treatment effluent by ciliates. Microbiological treatment of municipal sewage sludge and refuse as means of disinfection prior to recycling in agriculture. Modeling of organic matter destruction by microorganisms community. Effect of protozoa on bacterial degradation of aromatic hydrocarbons. Phenol and naphthalene degradation by mixed culture of microorganisms. Specific adsorption of metal cations on the surface of lipid membrane systems. The inverse fluidization - a new approach to biofilm reactor design, to aerobic wastewater treatment. Production of sugars from lignocellulosic wastes basic research and pilot studies. The future of the lignocellulosic wastes bioconversion. Detoxification of phenol polluted soil by some Nocardia and Basidiomycetes. The detoxifying roles of ferro-phenolic complexes produced by Nocardia. Microbial treatment of industrial wastes. Higher fungi as a potential feed and food source from lignocellulosic wastes. BIOENERGY AND ENVIRONMENT. Immobilized photosynthetic systems for the production of fuels and chemicals. Anaerobic treatment of excrements from large-scale animal farms. Intensification and ecological aspects of methane fermentation of agricultural wastes. Economic and bioenergetic aspects of methanogenesis - quantitative investigations. Recovery of energy from municipal solid waste in fabricated digesters. Landfill gas fuel and ecological problems. Biomass and the problems of ecology, agrochemistry and energy. POSSIBLE POSITIVE AND NEGATIVE IMPACTS OF BIOTECHNOLOGY ON ENVIRONMENT. Positive and negative impacts of biotechnology on the environment. Release of genetically-engineered microorganisms in the environment: risk of horizontal genetic-transfer. The role of culture collections to safeguard nature's microbiological resources. Is biotechnology a blessing in disguise? Improvements of agricultural crops by genetic engineering. The cyclodextrins and their application in environmental biotechnology. Biotechnology of metals and the environment. A small simulation system and ecological forecasting. A sterilizable centrifugal separation system for aseptic and contained cell harvest and recycle. The growing awareness of environmental problems provided the stimulus for this 4th International Symposium on Biotechnology, Interbiotech '90, to address many aspects of the relationship between biotechnology and the environment. The papers are mainly devoted to the contribution of biotechnology in solving environmental problems, including biological waste water treatment, utilization of municipal sewage sludge, detoxification of polluted soil and complex utilization of lignocellulosic wastes. There is examination of possible dangers in such cases as the release of r-DNA organisms into the environment. The relationship of biotechnology and energy (e.g. biogas, landfill gas fuel, photosynthetic systems for fuel production) is also discussed.